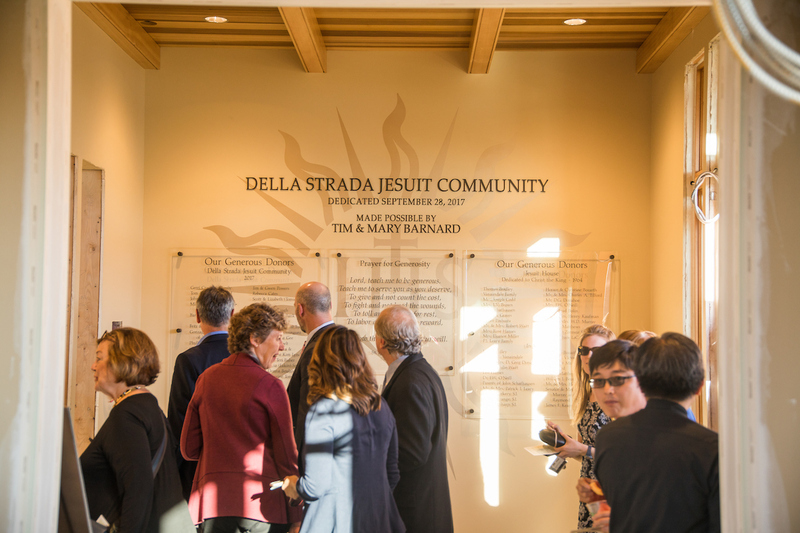 SPOKANE, Wash. – Gonzaga University leaders and community members gathered Thursday to formally dedicate and bless the Della Strada Jesuit Community, a new home and spiritual haven for the Jesuits of Spokane. It is located at the northwest corner of Boone Avenue and Astor Street and has been made possible by a leadership gift from Tim and Mary Barnard of Bozeman, Montana. Tim Barnard, who first became involved with Gonzaga when he attended Gonzaga-in-Florence, Italy, as a student in 1971, said he was profoundly influenced by a number of Gonzaga’s Jesuits and was pleased to support the new residence for Jesuits from Gonzaga, Gonzaga Preparatory School, and Spokane’s other Jesuit ministries. Barnard, who has served on Gonzaga’s Board of Trustees since 2000, was honored by Gonzaga with its Distinguished Alumni Merit Award in 2004. He received an Honorary Doctor of Laws degree from Gonzaga at the 2017 undergraduate commencement. 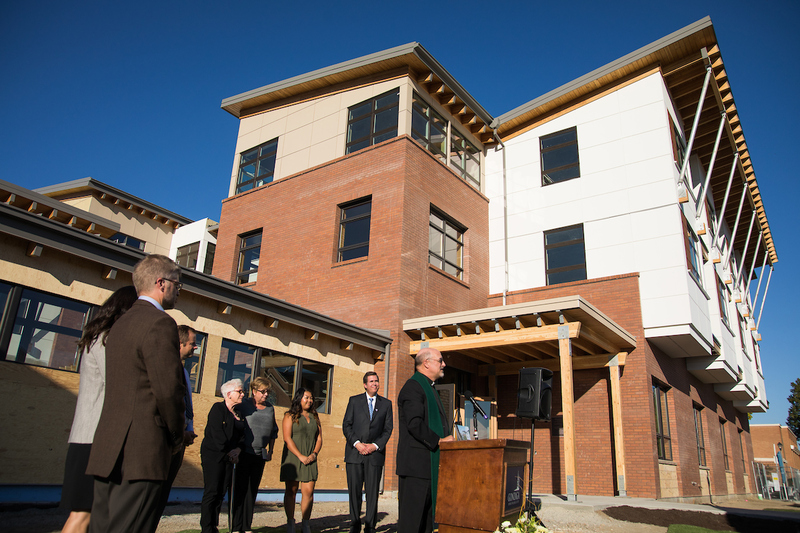 “Today we once again affirm Gonzaga University’s Jesuit, Catholic, and humanistic identity. 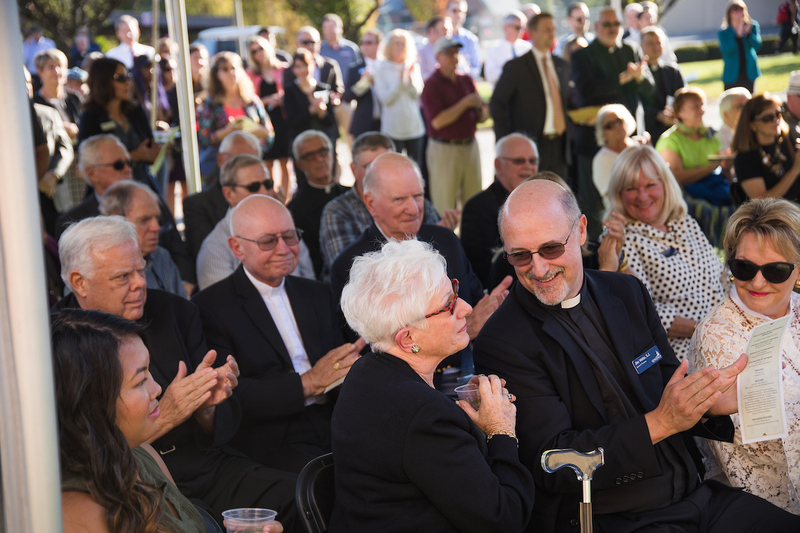 Through our collective will – our Gonzaga Will – we underscore our commitment to maintaining and sustaining the important work of the Jesuits in the Northwest. Let us continue forward, inspired by our rich Jesuit heritage and driven, tenaciously, to continue providing a world-class education for our students – developing the mind, body and spirit and empowering them to become leaders for the common good. This is our Jesuit heritage, a legacy and ongoing commitment that we must all own and carry forward for future generations,” President McCulloh said. 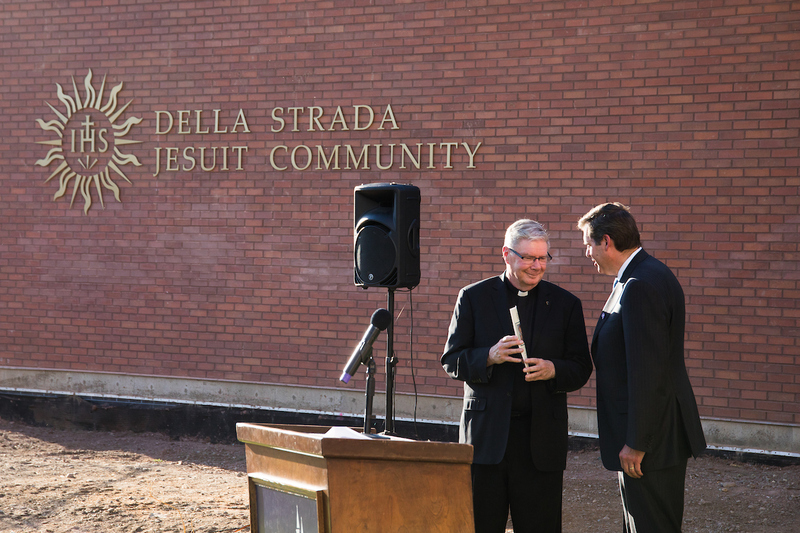 The 36,074-square-foot structure, with a total estimated cost of $13 million, includes reflective space to serve Jesuits seeking retreat, provides office and work space, and links the central life of the Jesuit community with Gonzaga students, faculty and staff. Architects for the project were BAR Architects of San Francisco and BWA Architects of Spokane. Walker Construction of Spokane served as the general contractor. Father Jim Voiss, S.J., rector of Gonzaga’s Jesuit community, blessed the facility in a ceremony involving: President McCulloh; Fr. Scott Santarosa, S.J., provincial of the recently combined Oregon-California province now known as USA West Province of the Society of Jesus; Fr. Pat Lee, S.J., GU vice president for mission and ministry; Michelle Wheatley, assistant vice president for mission and ministry and director of university ministry; GU student Isabel Gregorio; GU faculty President Brian Steverson; Gonzaga Prep President Michael Dougherty; Pat Reese, director of the Gonzaga Will capital campaign; Tim and Mary Barnard; and Gerri Craves, who spearheaded the fundraising effort. Fr. Lee shared that Madonna della Strada means “Our Lady of the Way” in Italian, and refers to a specific artistic representation of the Virgin Mary and Child. The original image, which is in Rome, was an object of devotion that first inspired St. Ignatius Loyola when he was a street preacher. The image was called “Madonna della Strada” because it was from the church that was called “Our Lady of the Way.” The church was on a ceremonial route on which the pope made his way to and from Roman churches. Over the years, this fragment of the original fresco was transferred to canvas that was mounted on a piece of slate and then displayed within the parish church. After the pope approved the Jesuit Order, he gave the parish church to the Jesuits. Before his death, St. Ignatius instructed the Jesuits to preserve the image, which was ultimately displayed for veneration at a side chapel in the Gesu Church, which replaced the smaller Madonna della Strada parish as the mother church of the Jesuits.